I love unique pieces–that’s partially why I I have a vintage obsession. Shocking admission, isn’t it?! So when it came time for Something Vintage to stop renting so many vans and trunks and buy a big girl vehicle, I cringed (literally) at the thought of having to drive around a cargo van. How could I willingly cough up thousands of dollars for a van I don’t even want to drive around? So I set out to find a van worthy of our awesome inventory. 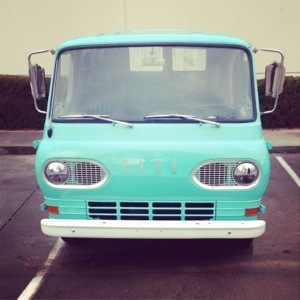 I considered all sorts of vans, but when I laid my eyes on a Craigslist post in North Carolina for a 1967 Ford Econoline with only 72,000 original miles on it—and the most important part of all–it was aqua, immediately pounced! Now, I’ve gotta learn how to drive a three speed on the column or as many affectionately call it, a “three on the tree”…and manual brakes and steering. Eeek! So I’m pleased to introduce everyone to Betty, the Something Vintage Van and the sweetest vintage cargo van I’ve seen in DC. Did I mention she is the ever-timeless aqua? !